Red Fox Pup(s) Morro Bay, CA 28 May 2008, originally uploaded by mikebaird. 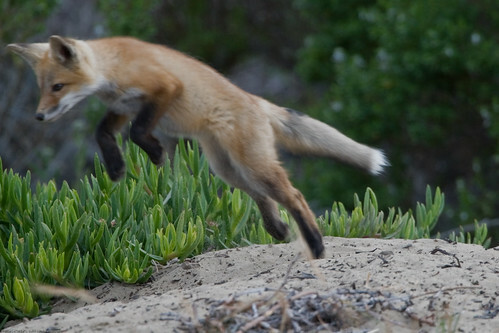 This week's "Photo of the Week" is of a red fox kit practicing his quarry leap. Too cute for words! Unfortunately, this little guy is likely to be captured and destroyed due to him being non-native to Morro Bay, and a threat to the Western Snowy Plover. Make sure to come back Monday, when I'll be discussing whether or not it's a good idea to feed your pet fox fresh meat.